Nearly five months after President Muhammadu Buhari was sworn into office, many parts of the president’s ‘change agenda’ still remain hidden from the general public. The manifesto of the president’s party, the All Progressives Congress, includes lofty goals in many policy areas from poverty reduction & unemployment to diversifying the economy. But from the manifesto’s claim to improve national and local security to providing universal education and healthcare, there has so far been severely limited progress in many areas. In some cases, the country appears to have regressed. For development to truly take root in Nigeria, it is to the minds of Nigeria’s young we must look. It is disappointing that President Buhari has neglected to incorporate the majority youth into the fabric of Nigeria’s developmental progress. 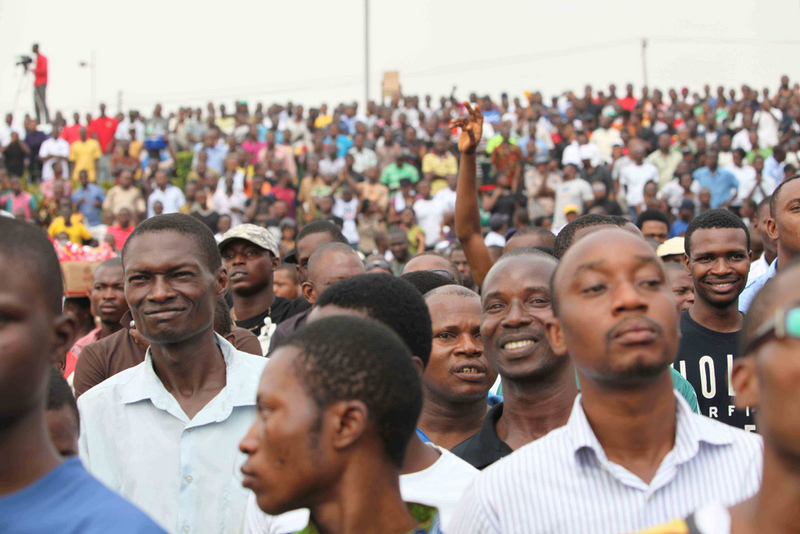 The Nigerian youth remains critically left out of the country’s decision making processes. The National Bureau of Statistics reports that 48.7% of Nigerians in the labour force aged between 15 and 24 were either unemployed or underemployed in the second quarter of 2015, compared to 44.3% in the first quarter. As of August 2015, there has been a 69.9% decline in job creation. As Nigeria maintains a tragic life expectancy of 53, the administration is yet to make headway in developing the healthcare sector. The country’s energy sector remains in crisis; and on too many counts, the consequence has been to stifle life and productive capacity in Nigeria. Nigeria is a land of the young. According to the CIA World Factbook, the median age in Nigeria is 18.2 years old. Those under 25 alone make up 62.39% of the population. Yet, under Buhari, youth unemployment rates have increased. The National Bureau of Statistics reports that 48.7% of Nigerians in the labour force aged between 15 and 24 were either unemployed or underemployed in the second quarter of 2015, compared to 44.3% in the first quarter. The rehabilitation of the Nigerian state, which Buhari is leading, must begin with those whose minds are still being shaped. A combination of unemployment and the stunted status of Nigeria’s university education, highlights the government’s neglect of the youth. Not one Nigerian university made it onto the 2015 Academic Ranking of World Universities, despite the presence of universities from developing countries such as South Africa and Brazil. In the preamble of the United Nations Educational, Scientific and Cultural Organisation is written: “since wars begin in the minds of men, it is in the minds of men that the defences of peace must be constructed.” Likewise, it is in the minds of the women and men that a country descends into malfunction. The rehabilitation of the Nigerian state, which Buhari is leading, must begin with those whose minds are still being shaped. For many members of Nigeria’s incredibly youthful population, a collective memory of Nigeria’s privileged past does not exist. Young Nigerians aged 25 and under have no political memory prior to Sani Abacha. When Abacha became the country’s military dictator in 1993, many Nigerians alive today were 3 years old. Some had not been born. We have neither seen nor have we experienced anything prior to the age of Nigeria’s tumultuous underdevelopment. An age that has appeared to many of us to quite literally define the entirety of Nigeria’s existence so far as our young lives are concerned. The ‘good old days’ of Nigeria never existed for us. The consequence of a mass youth who have only ever known a Nigeria consistently beset by morally defunct leadership, economic hardship for an absolute majority, and a state that has done very little to reward and encourage innovation and non-conformity is that many young Nigerians have been forced into believing that there exists only one of two options. Either we buy into a broken system in which we become ironic reinforcements of the political decrepitude that has characterized our entire existences or we become powerless victims who suffer the consequences of not toeing the line in an environment that promotes corrupt behaviour and a general mediocrity. The most powerful weapon for redevelopment that President Buhari has in his arsenal is the youth. The capacity for President Buhari to achieve a sustained change for generations to come lies all around him in the faces of Nigeria’s young. He holds the potential to give the majority young a brand new view of our country, and a fresh sense of our role in Nigeria’s development. An older generation has failed us; their failure is reflected in the fact that instituting the basic tenets of a minimally functioning democracy, as Buhari is attempting, should be heralded as heroic. For Nigeria’s youth, Buhari also represents a sense of relief; we have finally been allowed to witness a leader who might actually give us proof that there is a Nigeria beyond the political absurdities we have, up till now, witnessed. Earlier this year, President Buhari publicly declared his assets. By doing so, Buhari has shown young people that political elites must and can be accountable to the people. Though more an act of symbolism than anything else, it is still a powerful and unprecedented signal of change in our country’s political ethos. Indeed by publicly declaring his assets and demanding that all other government officials do the same, Buhari is abiding by and reaffirming the rule of law. In a humble yet effective way, he has made a powerful point that few other Nigerian politicians have even attempted to address. In the lifetime of many young people in Nigeria, the norm has been for public officials to receive wide praise during their tenures while it is openly acknowledged that these same politicians have engaged in a gross looting of the public purse. To the mantra of “everyone does it”, Buhari is responding by saying no; and that is a powerful example for us. By no means should the youth in Nigeria be satisfied with President Buhari. These are early days and judgement is yet to be made. In simply attempting to do the things that our elders should have been doing all along, Buhari is not a hero and he may never be. Slow-burning in his approach and with a lot more promises to fulfil, there are too many things that we must continue to demand from our president. Nigeria’s young must continue to push Buhari to move beyond professing his principles and to turning them into concrete action and results. We must continue to maintain a cautious optimism for a future in which the success or failure of the current administration is a critical factor. Nigeria’s young are not the future. We are the present. What hangs on Buhari following through on the change agenda he promised during the 2015 general elections is not the success or failure of a politician; but the transformation of our society and the fate of future generations. Buhari himself has acknowledged that he is not a miracle worker; and the issues of development facing the Nigerian landscape are substantial. Nevertheless, if Buhari fails to follow through in the tone that he has set for his administration, the consequence will be to forever concretise the ever-pervasive hopelessness that the young have been forced to live with. The consequences of a permanently disillusioned youth are unthinkable. An older generation has failed us; their failure is reflected in the fact that instituting the basic tenets of a minimally functioning democracy, as Buhari is attempting, should be heralded as heroic. We cannot, under any circumstances, afford to slip back into the historically prevalent norm of a thoroughly corrupt and dysfunctional society. To the extent that we congratulate our president for the boldness with which he has started fighting corruption, so also must we subject his regime to a constructive criticism as we recognise that there are areas in need of vast improvement and fast action. Nigeria’s young are not naïve. We do not expect to see the Nigeria of our dreams during Buhari’s tenure alone. But if he is able to positively affect our lives and our minds, he will have achieved the great feat of paving the path for us to carry on the work of building a nation. Nigeria’s young are not the future. We are the present. Kemi Lijadu is a Nigerian national. She is 20 years old. She is an undergraduate at Stanford University where she double majors in Political Science and Philosophy. She recently completed an internship with the Permanent Delegation of Nigeria to UNESCO at the headquarters in Paris, France. Lunacy! Revolutionaries are poets. You make a very pertinent case that should reverberate with all progressive human beings in this planet. The youth brings change and nurturing their skills make the dreams of a nation realistic and achievable. All governments should develop a versatile youth agenda. Failing the youth is failing the future. I commend your incisive mind. As George Bernard Shaw would say, progress is impossible without change, and those who cannot change their minds cannot change anything. The change of Nigerian youths must begin first in our minds.